In third form English we are taught how to 'read between the lines'. Now this is a concept which many of us ADD teenagers have a lot of trouble with...it's like every bone in our body does not want to find the deeper meaning in something that seems pretty clear to begin with. Reading between the lines is a skill which I've had to hone in over the past few years and I've actually become semi-good at it. The world seems like a better place once you think about everything like your looking through a lens that's on 10x optical zoom. You see, I'm a thinker. I think far too much. I believe that every single thing that I do, see or have happen to me has a deeper meaning than what would appear. 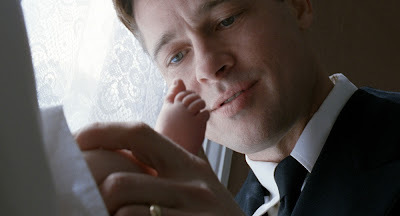 So yes, it came as no surprise that I genuinely liked Terrence Malick's latest The Tree of Life. This film is one that requires more than enough reading between the lines - because it is all the deeper meaning which makes the film work. In the 24 hours since I've seen the film, I've thought an awful lot about not only what the film was trying to say, but just about life in general. I often find myself asking existential questions, but I never thought that anyone would have the courage to make a movie based around human existence. That's what Malick does: shows us a bit about the world we live in and the kinds of people that we all are. What Malick has also done is make a film which is open to many different viewpoints, and the audience can leave the cinema interpreting certain things in their own way. I don't know whether there is a right or wrong way to interpret The Tree of Life, and it will probably become clearer to me after another watch, but this is how I got it: Towards the beginning of the film, Mrs. O'Brien (Jessica Chastain) says that there are two ways through life, the way of nature and the way of grace, and that we must choose one. She explains the differing two: "Nature only wants to please itself. Get others to please it too. Likes to lord it over them. To have its own way. It finds reasons to be unhappy when all the world is shining around it. And love is smiling through all things." and "Grace doesn't try to please itself. Accepts being slighted, forgotten, disliked. Accepts insults and injuries." Mrs. O'Brien is someone who lives by the way of grace, and comes across as a heavenly, peaceful person. However, Mr. O'Brien (Brad Pitt), is someone who lives by the way of nature, believing that the only way to get through this world is to be fiercer and stronger than others. As a child, their son Jack (played at first by newcomer Hunter McCracken, later by Sean Penn) finds it difficult to choose which path he should take. He toys with both, but then comes to the conclusion that he should follow the way of nature, with twinges of rebelliousness and experimental violence. Through that, we are essentially watching the loss of innocence through growing up - and young Jack's world being put through the perspective of the way of nature. Now, as I said, there are loads of ways that this film can be interpreted. That is mainly due to the fact that every single scene has more than two meanings, and some of the scenes don't fit with what everything else is trying to say. In the grand scheme of things, this movie is quite messy. Instead of following the conventional path that most movies adhere to, this one adopts an unconventional non-linear storyline. The film opens with the O'Brien's finding out that their son has just died, and from there it zig-zags between the modern day Jack and Jack growing up in the 1950's. In between all of that time, there is a sequence showing the formation of the universe, Sean Penn's character walking through a desert like area and several seemingly irrelevant shots of different things (oh, and dinosaurs, which made perfect sense to me right away). That is not to say that all of what happens in this movie are generally bad, incomprehensible things. As I said, this movie requires a bit of reading between the lines, and I'm positive that every single thing in this movie has a meaning. The problem I have with it all is the fact that it probably makes more sense in Malick's head and in his script. Some of what he was trying to say didn't translate well to the screen. For the most part, though, this film doesn't have any right to translate well on screen. For some reason, the meaning of life and all of these existential questions aren't the kind that makes for a good film. However, you really have to admire Malick's ambition. It's become the norm to make films just for those with ADD and who need explosions every five seconds. Malick, however, has created something which is as rare as they come. He mixes arthouse obscurity with a Hollywood budget and effects, which makes for one of the oddest marvels the cinematic world has seen in recent years - if ever. Now, I probably can't judge or anything considering that I haven't seen all of the films that every cinephile should have, but this movie is truly one of a kind. It has achieved something that no film has achieved before: provided a poetic and beautiful look at life in general, doing it in the most unconventional way possible. It's a film which is complicated, yet it doesn't waste it's time with expository dialogue. Instead, there is barely any dialogue, with the pictures, the faces, telling the story. The whispered narration, which comes and goes when you least expect it, is there to aid the film through each existential phase. It's also a film that is a visual treat - and that doesn't mean that it's made in 3D. When the film is not answering questions about the way of nature and the way of grace, it serves as a brilliant coming-of-age drama looking at the dynamics of family and parenting. I think this is mostly due to the brilliant and believable performances from Brad Pitt and Jessica Chastain as the parents, and the three inexperienced child actors who look like they have been acting all of their lives. Pitt's character is one that really angered me in this film, as he is so obsessed with power and the idea of being better than everyone else in order to lead a good life. I did fear him, as he had this quiet stare that was as menacing as it was inviting - he was still a good father who obviously loved his sons, but he kept trying to push his ideals onto the poor kids. Jessica Chastain, the golden girl of the moment, was brilliant in her role as a young mother. Every move she made, every look she gave, was just so motherly...I guess when we see her character floating around beneath a tree it's obvious what we should think of her: a heavenly, guardian-like figure. The three boys, Hunter McCracken, Laramie Eppler and Tye Sheridan all show natural fun in their sun-kissed portrayals of wondrous youth and staying outside until dinnertime. McCracken, in particular, excels with his confused character, showing the battle between grace and nature in his face. Then there's the small matter of Sean Penn. He doesn't have a leading role, but I do have to say, he adds a lot of the finishing shine to such a movie. His character, mostly silent, except for the narration, wanders through life misguided and still saddened by his brother's death. In his scenes, he can be seen in a normal city, flattened by huge glass sculptures of buildings. All of this artificial beauty is around him and yet he can't be happy. Everything is dark and dreary, as opposed to the sunlit cascades of his childhood. This is yet another thing I picked up from this film - it's also about the disillusion of adult life and what our world has become. I suppose that this isn't a major theme in the film, though. After the cityscapes and business end of Penn's time on screen, he is seen wandering, aimlessly, just as he would down a street in his city. Except, this wandering provides a gateway to forgiveness and reconciliation. This is just another thing which The Tree of Life handles. It looks over many things in life, and doesn't particularly teach anyone how to live their life or what the right path to follow is. Instead, it just wants to say a few things about our lives that we probably haven't thought of ourselves. It wants to alert us to the fact that not everything in our lives are as they directly appear. 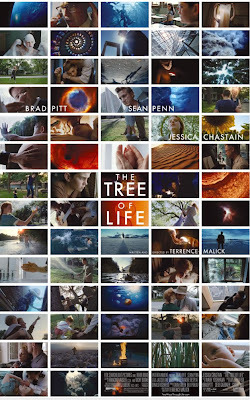 The Tree of Life is an over-indulgent, sometimes boring, self-absorbed piece of work. That's what it appears to be on the outside. But on the inside, the film is a poetic, beautiful, dazzling, unique, amazing masterpiece. I can immediately predict that this film will be widely loved in the next few decades, and people will remember 2011 as the year that Terrence Malick brought us The Tree of Life, which was met with polarizing reactions. Then, I'll be able to say that I saw it when I was 16 years old, and it was the first time I'd ever been wholly affected by a movie and realised that films can do things that films could never do before. It's hard to describe such a film as The Tree of Life, as there never has been, and probably never will be, a film like it. THE VERDICT: Beneath its arty veneer, The Tree of Life is a magnificent film about the meaning of life, using brilliant visuals and some minimalistic, yet effective performances. It's not for everyone, but it will be a renowned classic in a few decades time. I'd love to say I could give it a rating - but I really can't. I want to give it a full rating, but there are many things I didn't like about the film which could make me give it a low rating that it doesn't deserve. And I just don't feel right about giving it a rating either, so, sorry to disappoint! You're so right about the difficulty of giving this a rating since it's in it's own class / genre. I had to break the grade into two, one for a film and one for visual art, because conceptually I thought it was beautiful and brilliant but as a film I didn't think it worked that well. I have to disagree on the Sean Penn bit, I mean he even himself said "what am I doing in this movie?". I think his part was either edited too much or should've been left out completely. It didn't really open up to me TBH. Rating this film is very difficult but that's what so great about it because it actually does more than what most movies tend to be. It's a grand piece of art that isn't seen very much in a lot of films today. I was hoping to see the film again in theaters so I can do another take on the film but I'll have to wait for it on DVD. All I know is that Malick is right now, the best filmmaker working today. Funny that you're reviewing this film right now, as I just wrote a review on it as well. If I ever have kids or even grandchildren, I'm definitely looking forward to show them the film and tell them I watched it when I was 16 in tiny theatre, in a quite uncomfortable chair, and that it changed my life. I need to watch *all* of Malicks films before the end of the year. At first, I struggled rating this film, and then gave it an entirely subjective rating, which I think was the best thing to do. It's not perfect, but it's one-of-a-kind, and yes, it's a masterpiece. Glad you enjoyed it. I'm seriously hoping it shows up in the cinema down here but it doesn't look that way. Really want to see it, too. Oh well, too bad. Great review by the way. You really put a lot of heart into this one, so it's obvious you were passionate about it. There have been a lot of films I've found difficult to rate, but I suppose I never guessed this would be one of them. Films like this are so difficult to rate - you wrote so beautifully though Stevee! I have a week off uni so I'm definitely going to try and get the cinema and finally see it! This post is wonderfully done and might well be the best summation of this truly challenging film. Well done Stevee...many writers much older than you aren't nearly this articulate. 5plitreel - I think the visual rating would be a lot higher than the film rating for me. Mind you, I did like it as a film. At first, I did think that Sean Penn was a bit of a waste of time in the movie. And in some ways, I still do. But I think his appearance does give the story something else...I don't know, if I watch it again, I may be able to sum up my opinion on his role. thevoid99 - It is a very different movie, indeed. I'm probably going to wait until it's released on DVD to give it another take, too. Lime(tte) - I read your review! Nice stuff. I'll tell my kids that I saw this when I was 16, my first time at the indie cinema, in quite a comfortable chair. I need to watch Malick's films too! Tyler - Well, it might show up. Otherwise, you might have to wait! Thanks! This review did turn out very passionate. Ruth - Thanks! I hope you like it...I'm sure you'll get something out of it. Ryan - Seriously, that's like the best thing I've read all day. Thank you so much! The Tree of Life has been out in the UK for nearly two months now, and I still haven't seen it. It is playing in a cinema near my work, actually, so I'll probably hop on down there at some point during this week. I'd say, even though I say this a lot recently with your reviews, that this is the best review you have done. Loved it. I didn't give a rating myself so I can testify of how difficult it is to assign a grade to this movie. I definitely agree that it will be a classic within a few year's time. It's certainly a movie that isn't for everyone but the more I think back about it, the more I love it. It's truly an unforgettable experience. Cherokee - If you get the chance, give it a go. You'll probably get something out of it! I still haven't seen any other Malick films (bloody Fatso stuffed up my queue so I didn't get Days of Heaven like I planned). I think we have The New World at work, so I'll give it a go one day. Seriously, this is my best review? Wow, thanks! Castor - It is really difficult to give it a rating! The more I think back about it, the more I like it too. And I won't be forgetting about my experience with it any time soon! I agree that the film is occasional self-indulgent and self-absorbed. It's a film with a lot of meaning, but I'm not sure if it quite has the deliberate flow of images it needs. I much prefer Malick's other films, but there is still something astounding and gripping about this film. Even though it's flawed, I look forward to watching it a third time and probably a fourth and fifth time. And yes, I love that you talk about reading between the lines. There's so much there and I think that a lot of people who didn't like the films were those unwilling to look for that deeper meaning. Yes - I totally agree. This film is extremely flawed, but somehow those flaws don't mean as much when the film is so astounding. I believe in order to 'get' this film, there is a bit of reading between the lines required for it. Which is why, I think, a lot of people don't like it as much as others. You know, recenly I've been longing to re-watch it so much, so that it almost drives me crazy. Thank goodness they show Melancholia here, so that I'll be able to turn my thoughts to another film. However, The Tree of Life is still so haunting. I'm sure that upon me next viewing I'll understand more from what it hides. As for Sean Penn in this film, I agree with you but have you read trivia on IMDb (it can be not trivia, but I remember that I read it somewhere on the film's page there) that Penn said he sees no point of his character? I'll have to focus my attention on that when re-watching it. Maybe, he's right, but for now I don't understand why he said that. And there is a tiny thing I can't agree with you on. You said this film is not trying to teach, it just wants to say something. However, I felt it was really preachy. I'd have to throw in with cinemasights. I think the film is very flawed, and not just in the way that it's a little messy. I think that there are some structural issues, and I think that the ideas and meanings the film is going for get lost a bit because of that; they are only made apparent most of the time because the narration is so overt. I think it's a good film, but in trying to reach for the sun I think Malick fell a good deal short and ended up with a film I'd easily rank below all his others. It does look pretty darn beautiful though, doesn't it? Lesya - I still really wanna see it again, but I also wanna see Melancholia again (a lot)...you just can't win! I read about what Sean Penn said, too. I can get where he is coming from, but there is this whole facet to his character which I feel was necessary. I didn't think it was that preachy...but then again, I don't know what this 'preachy' term really means! Corey - Yup, it is a very flawed movie. There are structural issues which really bothered me, too. But yeah, it's a very good film!